About Showboat (1929), it is what was known as a "goat gland" -mixed silent and sound. The film has a prologue with the musical numbers that were in the Broadway show. Then the film starts and it is mainly silent with some talking passages. Many films from 1928 and some from 1929 are oddly put together that way. I see. Should be interesting! thanks for this info, which is fascinating- but pray tell- how the HELL did they come up with the term "goat gland" for an early part talkie/ part silent picture???! Weren't goat glands used to treat impotence back in the day? I saw this in a drive-in when it first came out, and it was pretty scary. Seen it on TCM a few times since. Nice to see Christopher Lee playing a good guy for a change. Satan makes a cameo appearance. Definitely not a retread of Horror Hotel. I much prefer its later incarnation as the LOUGHVILLE/GHOULVILLE story in ROY WARD BAKER'S THE MONSTER CLUB. Goat gland was a term applied c. 1927–1929, during the period of transition from silent films to sound films. It referred to an already completed silent film to which one or more talkie sequences were added in an effort to make the otherwise redundant film more suitable for release in the radically altered market conditions. The name was derived by analogy from the treatment devised by Dr. John R. Brinkley as an alleged cure for impotence. There's a goat gland joke in Buster Keaton's "Cops." That's how I knew about it. Buster accidentally goes into his office! I wouldn't really compare The Devil Rides Out to City of the Dead, beyond the most superficial similarities (British horror and featuring Christopher Lee). The former movie has a tongue-in-cheek feel, although it's played mostly straight. There's a certain florid camp to the full-color proceedings. The latter film is moodier, B&W, and more interested in being creepy and scary. I like them both, although I've read negatives about each from others in the past. Learn something every day! Wonder how they came up with that term??? I don't remember ever reading why they were specifically called goat glands, but I think it referred to increasing the potency of the movie by adding sound - at least that's what they thought they were doing at the time. If you ever watch 1928's Noah's Ark, it has talking passages, but they are the worst parts of the film. To Gershwin Fan: Yes I remember that Buster Keaton short with the goat gland doctor. If I remember correctly Buster comes out of the office bouncing around and acting revitalized. 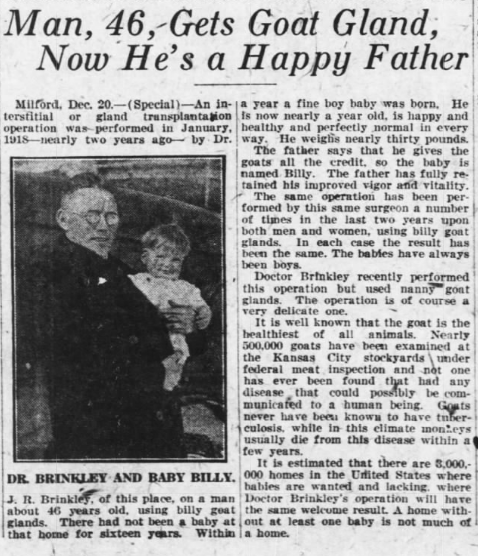 What they probably didn't say was that while the husbands were recovering from the surgery, Dr. Brinkley was out impregnating their wives. 10:15 p.m. Straight Time (1978). Both Dustin Hoffman and Theresa Russell are pretty good in this one. It’d be funny as Hell if the kid had a little chin beard and liked to eat out of the garbage. 10 a.m. Popeye: Adventures of Popeye (1935). 10 p.m. King Lear (1971). With Paul Scofield. Not to be confused with the Russian King Lear released the same year. For Saturday afternoon, I recommend The Night Digger (aka The Road Builder), with one of Patricia Neal's best roles. The lives of Patricia Neal and Pamela Brown (always great) are changed when a gorgeous young man (Nicholas Clay) becomes part of their life. By the way, I'm not especially fond of Peter Brook's very one-note King Lear, despite the presence of Paul Scofield as Lear and Irene Worth as Goneril. Jack MacGowran brings the film to life in his brief appearances. I agree. The stand out in the cast for me beside Scofield was Alan Webb as Gloucester, the Elder. 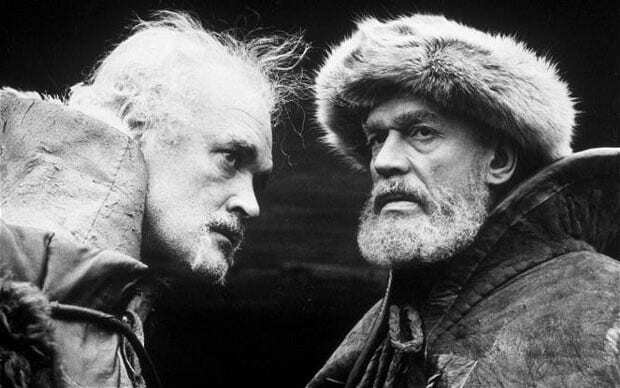 I much prefer the Russian King Lear (also 1971) by Grigori Kozinstev, though even that is not as good as his Hamlet (1964) which is one of the best Shakespeare adaptations ever made. 2 a.m. The Green Ray (1986). An Eric Rohmer film that I haven’t seen. ps- it's worth mentioning it was scripted by ROALD DAHL although we are miles away from The Chocolate Factory with this one. Neither have I, and I'd like to check it out. I believe that "Le rayon vert," the French title, is what we call "the green flash," when you can see a brief moment of green just as the sun goes down. I've been lucky enough to see this a couple of times. Abbott and Costello Meet the Mummy- This one of the funniest of their films. 4 a.m. 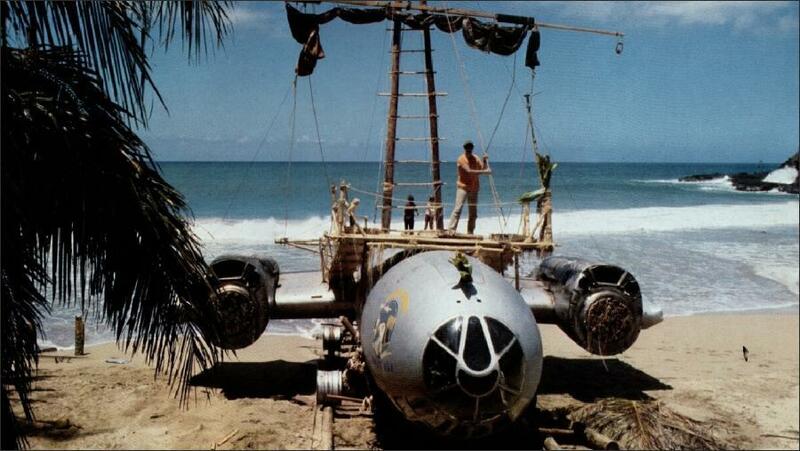 The Last Flight of Noah’s Ark (1980). I can hear the pitch now. Take The Flight of the Phoenix and combine it with the Noah’s Ark story and this is what you get. With Elliott Gould and Genevieve Bujold. Not the cast that comes to my mind but you can't eat your principles.